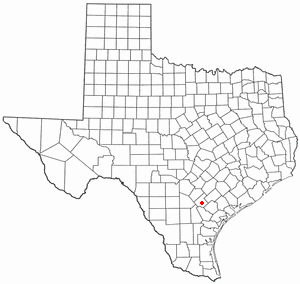 Kenedy is a city in Karnes County, Texas, United States, named for Mifflin Kenedy, who bought 400,000 acres (1,60Square kilometers) and wanted to develop a new town that would carry his name. The population was 3,487 at the 2000 census. In the Early 1900s many of Kenedy's gunfighter's shooting caused the town to be nicknamed "Six Shooter Junction". During World War II, the Kenedy Alien Detention Camp was located near the outskirts of the town. This was a prisoner of war camp that started as an internment camp for Germans, Italians, Japanese, and South Americans. Here's the our members favorite photos of "Cities in Texas". Upload your photo of Kenedy!